Once a week, the serenity is interrupted by the sound of a horrific car crash. Sometimes, it’s a tire screech followed by the faint dint of metal on metal. Other times, a boom stirs the neighbors outside to gawk. It’s always at the intersection of Hillegass, my block, and Ashby, one of the city’s thoroughfares. It generally happens around rush hour, when the street is clogged with cars. 2005: Google Maps is launched. “The phenomenon you’re experiencing is happening all over the U.S.,” says Alexandre Bayen, director of transportation studies at UC Berkeley. Pull up a simple Google search for “neighborhood” and “Waze,” and you’re bombarded with local news stories about similar once-calm side streets now the host of rush-hour jams and late-night speed demons. It’s not only annoying as hell, it’s a scenario ripe for accidents; among the top causes of accidents are driver distraction (say, by looking at an app), unfamiliarity with the street (say, because an app took you down a new side street), and an increase in overall traffic. It’s worth breaking down the layers. The first is the large number of drivers that utilize the apps, a percentage that grows by the day. In 2011, Waze had 7 million downloads; that number climbed to 50 million by 2013, and 65 million in 185 countries by 2016. Meanwhile, Google Maps has well over 1 billion monthly users. The second, newer layer is the fleet of ride-share vehicles. There are an estimated 45,000 Uber and Lyft drivers in San Francisco, compared to 1,500 cab drivers. The two ride-sharing titans have each designed their own mapping apps — Lyft Navigation and Uber Driver — but Navigation was built using Google Maps, and Uber’s app has yet to be fully rolled out. (Anecdotally, I have yet to ride in a car whose driver doesn’t use Waze.) Whatever the device, it’s one dictated on concrete route efficiency, as opposed to the whims of cab drivers, who use thoroughfares or “their own” shortcuts. All that extra traffic down previously empty streets has created an odd situation in which cities are constantly playing defense against the algorithms. My favorite coalition of grumps have been the residents of Takoma Park, Maryland, who actually spent time falsifying accident reports to Waze in order to prompt the algorithm to shift the route elsewhere. But all of the actions, either infrastructure changes performed by the city or hacks by community groups, have the same intended purpose: “I will make driving through our neighborhoods more difficult, so you will not use the street,” says Jeff Ban, a professor of civil and environmental engineering at the University of Wisconsin. Outside parties disrupting a city’s infrastructure is nothing new. In the past, they’d solve that problem by placing fees on whoever was the cause. If a grocery chain wants to build a supermarket, the city calculates how much extra traffic is expected, and imposes an “impact fee” for the strain caused by the extra traffic on public thoroughfares. But in the odd case of map apps and ride-shares, who gets the fee? The “disruptive” apps? The ride-share services physically clogging the streets? The users, the state, the cities themselves? 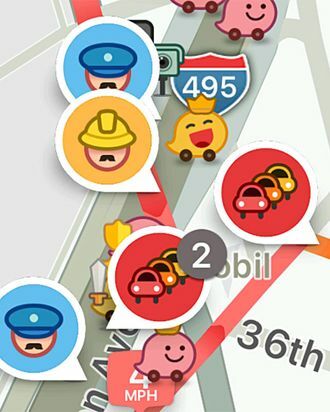 Are a bunch of class-action lawsuits — like the one directed at Waze from an Israeli suburb — the future? There is, of course, another obvious solution available that’d avoid the messy nature of fees and litigation, put the halt on city-waged infrastructure resistance, and also end the new traffic jams.